Here comes the flood. My worst fears of The League’s leader Matteo Salvini’s ego getting in the way of seizing the political moment by the horns were overblown. It feels good to be wrong every once in a while. It looks like coalition talks between The League and Five Star Movement (MS5) have been productive. A new post from Mike “Mish” Shedlock reveals the likely structure of a new parliamentary deal which has neither Salvini nor M5S’s Luigi Di Maio taking the role of Prime Minister. The end of the pension reforms under Mario Monti; Five Star is softer on this point than Lega, but together the two parties can be expected to agree fundamental changes. A flat tax on companies and people – in other words a massive tax reduction. A study on the so-called minibot. This is a parallel currency based on future tax receipts, similar to the plans proposed by Yanis Varoufakis in Greece. The minibot was in the Lega’s election manifesto. Five Star is far less radical on the eurozone, having dropped the idea of a referendum, but also seeks changes that are incompatible with the the EU fiscal rules. A parallel currency stands a much greater chance of success in Italy, and it would go some way to solving the government’s fiscal dilemmas. The open question is whether it would constitute a slippery slope towards euro exit. And a citizens’ income, which is Five Star’s big idea, to be implemented next year. Because M5S and The League are so fundamentally different, this platform is going to be schizophrenic. Basic Income is idiotic, especially with a radical tax reduction. But it’s the price to getting the deal done. The most important part of this deal is the realization on both sides that leaving the euro is not politically viable in the near term. Believe me, I wish it were otherwise. M5S was smart to soften its stance to get the votes. That is going to have to be a conversation with Italians over time. First, the outsiders have to prove they can work together. Then they have to lead and gain real and visceral support from the people. Trust first, rebellion later, as it were. Where they gain immense political capital is in standing up for Italy against Brussels on Immigration. Immigration and economic opportunity are two sides of the same coin, politically. This link gets stronger the worse the economic conditions are. When you have a sclerotic democratic socialist system like in most of Europe, and then add a technocratic bureaucracy on top of it, you have a powder keg of political revolt. When the foreign bureaucracy demands enforced immigration to lower labor costs and destroy your culture on the altar of Marxism and globalism, it creates the perfect vehicle for the newly-elected rebel parties to gain tremendous political capital with its people by saying no more. Just look at places like Hungary, Austria, the Czech Republic and Russia. Viktor Orban and Vladimir Putin have provided the blueprint for how to consolidate power in response to irresponsible immigration policy. Now look at Italy. The League and M5S can form a lasting partnership if they present a fully-united front to Brussels on this issue. And by being opposed on certain issues, it presents an honest face to the people that Italy comes first and from there we can sort out the other problems. Salvini knows the euro is killing Italy slowly. So did M5S’s former leader Beppe Grillo. Both parties want out of the euro but for different reasons. The Jury is out on Di Maio. And in the long-run, absent a shift in political philosophy, this coalition will be, at best, difficult to hold together. But a study on a parallel currency is the Goldilocks path on the other pressing issue to Make Italy Great Again. Creating an internal domestic currency to run the country on while settling cross-border payments in euros is the means by which to prove to the people what the euro has done to them. And, any opposition to this plan from Brussels will be seen as yet another way to subjugate Italians à la immigration. Build the opposition to the euro over time while capitalizing on the anger at the EU now. Austerity is what we Austrian economists preach: lower taxes, less government spending, fewer regulations. Also, hold monetary policy as neutral as possible and let the currency do what it’s going to do to balance the government’s books. German Austerity is higher taxes to balance the budget, lowered spending and a strong euro. The latter benefits Germany, under-pricing German labor and over-pricing the vassal state’s. This keeps that country trapped through high debt servicing costs, never paying off its bills. Eventually, it sells to Germany its tangible assets at stink bid prices and while rolling the debt out farther in time, c.f. Greece. Merkel will push this hard-line stance. That’s her democratic mandate. Italians aren’t ready to give up the euro, which damned Greece in 2015. Salvini and Di Maio need room to negotiate. But, they have to be united on this issue. Brussels will try to drive a wedge between them. Look for Berlusconi to re-emerge as a “voice of reason” during Italian debt talks. The parallel currency offers a way around this stalemate while they remind Italians what Germany did to Greece. If they were really smart they would link Merkel’s immigration policy to the damage she did to her image in the Greek debt negotiations. 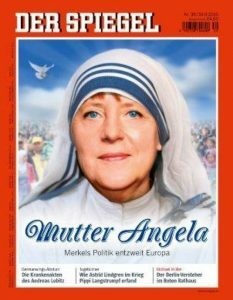 She used a unilateral open borders mandate to re-frame herself as Mother Theresa after Europeans were outraged at how Greece was thrown to the wolves. I don’t envy the task ahead of Salvini and Di Maio. But they have the tools to push for a great deal on debt relief from Merkel and the EU. But they have to have their ducks in a row. Things are accelerating quickly. And if I’m right and Donald Trump just touched off the next big dollar rally, a plunging euro will help them in this initial stage of their coalition. Because with this coalition and this proposed platform, the markets will react negatively to lower taxes and universal basic income at the same time. This will push up Italian bond yields and CDS spreads. It will make it harder for the ECB to maintain its negative interest rate policy if the euro begins crashing. But, at some point this false equilibrium has to be tested by the markets. The euro at $1.19 is a fiction. Italian 10 year debt trading at 1.85%, more than a full point below the U.S. 10 year note, is a fiction. 3 month EURIBOR rates at -0.33% is a fiction. That the ECB is ever going to stop buying Italian debt is the biggest fiction of all. And once the bond vigilantes call Mario Draghi’s bluff, which could be as soon as Monday, many, if not all, of these fictions will be revealed overnight. At that point Salvini and Di Maio better be ready to move quickly from studying their parallel currency to printing it. Because if they don’t, this new alliance will be broken up before it even begins.